A major controversy about USDA grain stocks estimates erupted during the last decade. We found in an earlier study that there had indeed been a sharp decline in analysts’ ability to anticipate actual quarterly corn stock estimates over the 2006-07 through 2012-13 marketing year (Irwin, Sanders, and Good, 2014; farmdoc daily, January 17, 2014; January 29, 2014; February 7, 2014; February 13, 2014; February 14, 2014). However, a similar decline was not found for soybeans, which was one of the reasons that we argued there was nothing inherently amiss with the USDA’s corn stocks estimates. After all, corn and soybean stock estimates are based on the same USDA survey. Instead, we argued that the decline in analysts’ ability to anticipate actual quarterly corn stock estimates for the 2006-07 through 2012-13 marketing years was most likely explained by unusually large and unresolved sampling errors in USDA corn production estimates, particularly for the 2009, 2010, and 2012 crops. We updated the results for corn and soybeans through the 2015-16 marketing year in a recent farmdoc daily article (July 20, 2016), and the updated results confirmed our previous conclusions. In this article, we make use of new data for quarterly wheat stock estimates to provide a fresh comparison to corn and soybeans. We begin with a brief review of our previous results for corn and soybean stock estimates (see our farmdoc daily article from July 20, 2016 for full details). In our previous work, the magnitude of the surprise in each of the quarterly stocks estimates from September 1990 forward was defined as the percentage difference between usage of corn/soybeans in the preceding quarter as implied by the stocks estimate and usage as implied by the average trade guess of the size of the stocks estimate. The analysis was careful to adjust calculations of the usage surprises during the first quarter of the marketing year (September -November) for surprises in the revised production estimates released at the same time as the December 1 stocks estimates. As shown in Figure 1, that analysis revealed there was a sharp decline in analysts’ ability to anticipate the USDA quarterly corn stock estimates for the 2006-07 through 2012-13 marketing years. 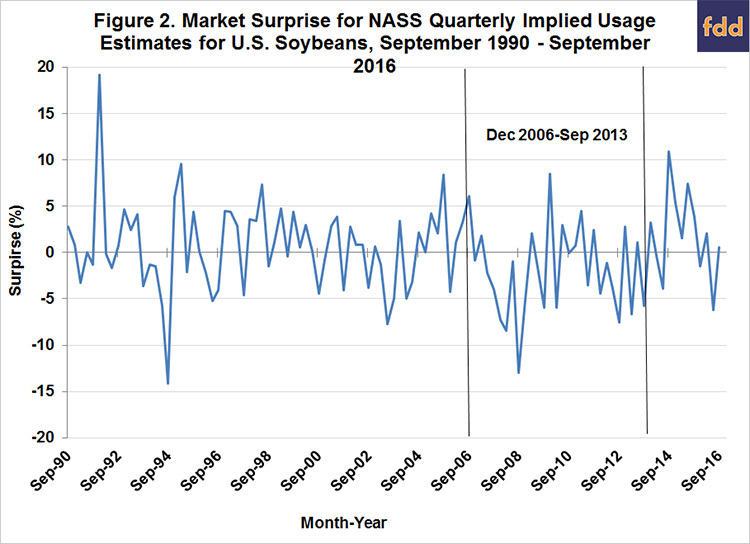 Figure 2 shows here was not, however, a similar decline in analyst’s ability to anticipate the USDA quarterly soybean stocks estimates. In addition, the usage surprises stemming from USDA’s quarterly estimates of corn stocks were much less pronounced in the 2013-14 through 2015-16 marketing years. The magnitude of the surprises in implied quarterly usage for those three years was similar to the period prior to the 2006-07 marketing year. To provide further insight about surprises in the USDA’s quarterly grain stocks estimates, we now examine the surprises in the quarterly wheat stocks estimates. This analysis is conducted to determine if the changing pattern of surprises identified for corn, but not for soybeans, is indeed unique to the corn market. 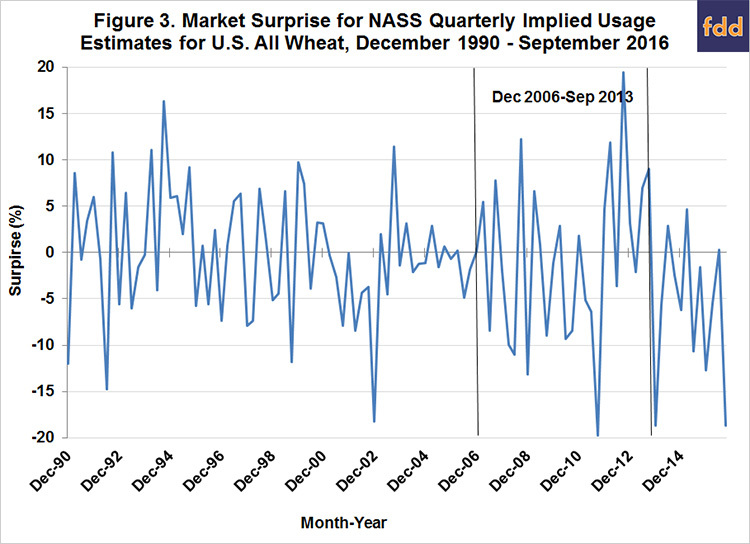 The magnitude of the usage surprises revealed by the quarterly wheat stocks estimates, as defined above for corn and soybeans, from December 1990 through September 2016 are shown in Figure 3. Note that grain stocks estimates for wheat are aggregated across all categories of winter and spring wheat grown in the U.S. and we were careful to adjust calculations of the usage surprises during the first quarter of the wheat marketing year (June – August) for surprises in the revised production estimates released at the same time as the September 1 stocks estimates after 1993. The pattern of surprises in the wheat stocks reports differs from that for corn in two ways. First, the volatility of wheat surprises generally exceeds the volatility of corn surprises for the entire period. Wheat implied usage surprises not infrequently exceed +/- 10 percent. Second, the volatility of wheat surprises increased about 30 percent for the period December 2006 through September 2013 compared to the period from December 1990 through September 2006. In comparison, the volatility of corn surprises increased by more than 100 percent during the period December 2006 through September 2013. While the volatility of wheat surprises throughout the sample is much larger than for corn, the pattern has been more consistent over the entire time period than is the case for corn. In that respect, the pattern of wheat surprises is more similar to the pattern of soybean surprises than to the pattern of corn surprises. Since USDA corn, soybean, and wheat stocks estimates are derived from the same survey process, the pattern of wheat surprises confirms our previous conclusion that there has been nothing inherently amiss in the USDA estimation process that explains the pattern of large surprises for corn from December 2006 through September 2013. Instead, the results tend to confirm that large surprises for corn appear to be explained by unresolved errors in corn production estimates. Market analysts have noted for some time that the occurrence of large errors in anticipating USDA quarterly crop stocks estimates could be related to January USDA estimates of production that are sometimes incorrect. More technically, large market surprises may be related to large sampling errors for January production estimates. While there is a tendency among market analysts to declare January production estimates as “final,” and therefore, having minimal errors, USDA is always careful to include a detailed discussion of potential sampling errors in production reports. Sampling errors in production estimates are more likely to occur for corn than for soybeans or wheat. All but a small fraction of soybean use is measured and reported in weekly USDA export reports and monthly crush estimates provided by the National Oilseed Processors Association, the Census Bureau prior to July 2011, and by the USDA since May 2015. This almost complete accounting of soybean usage allows for a relatively precise final estimate of soybean production once the stock estimate for the end of the marketing year becomes available. The USDA’s National Agricultural Statistics Service, then, often revises the estimated size of the previous year’s harvest when the end-of-year stocks estimate is made. That is, errors in production estimates tend to get resolved. While revisions are typically fairly small, they have exceeded three percent on two occasions since 1990 (3.3 percent in 1993 and 3.5 percent in 2007). Similarly, wheat exports are reported on a weekly basis and prior to 2011 the usage of wheat for domestic processing was reported quarterly by the Census Bureau. Feed and residual use of wheat is a relatively small percentage of total use so that usage is largely known by year end. As a result, errors in production estimates that are embedded in unmeasured use that is allocated to feed and residual have likely been relatively small in wheat. For corn, exports are also reported on a weekly basis. In addition, weekly estimates of corn used for ethanol production can be fairly accurately derived from weekly estimates of ethanol production. Since February 2015, the USDA has reported monthly use of corn for ethanol production. Still, a large portion of corn use (about 37 percent in recent years) is not measured and is reported as feed and residual use. Unreported use, then, is large enough to potentially mask errors in production estimates. It seems reasonable to expect that unresolved errors in production estimates as large as the 3.5 percent revision in the soybean production estimate in 2007 may have occurred. With a crop near 14 billion bushels, unresolved errors in production estimates could be as large as 490 million bushels. Any such errors make anticipating USDA quarterly stocks estimates difficult, resulting in occasional large surprises. The USDA grain stocks estimates play an important role in monitoring the pace of usage as the marketing year progresses. These estimates have been highly controversial at times during the last decade, particularly for corn from December 2006 through September 2013. This has raised the question of why the estimates have been so hard to anticipate by market analysts. Some have argued that the USDA survey process is flawed for various reasons. One way to address this is to examine whether the “problems” in corn are also found at the same time in other grains. We find that soybeans and wheat market surprises for grain stocks reports did not exhibit the same elevated volatility as corn for the period in question. Since USDA corn, soybean, and wheat stocks estimates are derived from the same survey process, we argue nothing has inherently been amiss in the USDA estimation process for corn. The more likely explanation for the occurrence of large errors in anticipating USDA quarterly corn stocks estimates is unresolved sampling errors in January “final” USDA estimates of corn production that are sometimes incorrect by non-negligible amounts. The influence of these unresolved errors is simply a fact of life, sometimes overlooked, when interpreting USDA corn stock estimates. Irwin, S., D. Sanders, and D. Good. "The Role of Sampling Errors in Explaining Recent Surprises in USDA Corn Stocks Estimates: Part II." farmdoc daily (4):28, Department of Agricultural and Consumer Economics, University of Illinois at Urbana-Champaign, February 14, 2014. Irwin, S., D. Sanders, and D. Good. 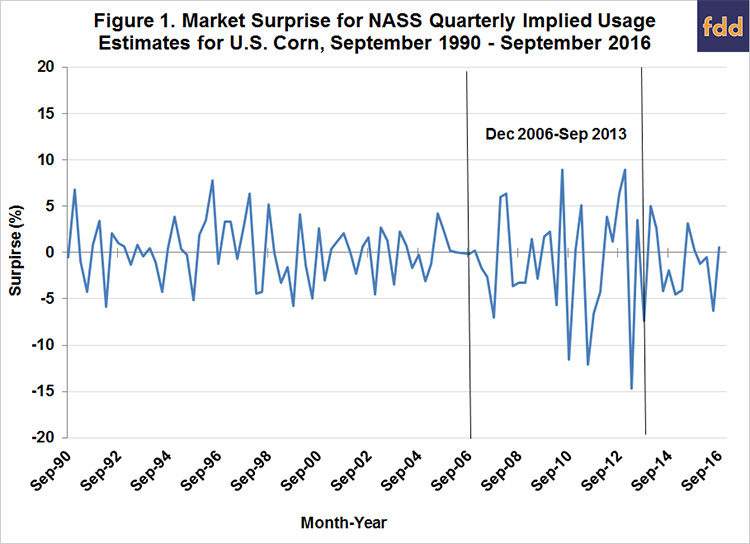 "The Role of Sampling Errors in Explaining Recent Surprises in USDA Corn Stocks Estimates: Part I." farmdoc daily (4):27, Department of Agricultural and Consumer Economics, University of Illinois at Urbana-Champaign, February 13, 2014. Irwin, S., D. Sanders, and D. Good. "Explanations for Recent Surprises in USDA Corn Stocks Estimates: How Well Do they Hold Up?" farmdoc daily (4):22, Department of Agricultural and Consumer Economics, University of Illinois at Urbana-Champaign, February 7, 2014. Irwin, S., D. Sanders, and D. Good. "Is There a Problem with USDA Grain Stocks Estimates in Corn?" farmdoc daily (4):15, Department of Agricultural and Consumer Economics, University of Illinois at Urbana-Champaign, January 29, 2014. Irwin, S., D. Sanders, and D. Good. "Evaluation of Selected USDA WAOB and NASS Forecasts and Estimates in Corn and Soybeans." farmdoc daily (4):8, Department of Agricultural and Consumer Economics, University of Illinois at Urbana-Champaign, January 17, 2014. Irwin, S.H., D.R. Sanders, and D.L. Good. "Evaluation of Selected USDA WAOB and NASS Forecasts and Estimates in Corn and Soybeans." Marketing and Outlook Research Report 2014-01, Department of Agricultural and Consumer Economics, University of Illinois at Urbana-Champaign, January 2014.